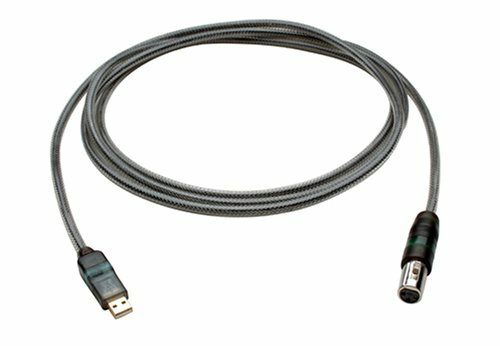 This LightSnake cable is a XLR microphone to USB cable that is ideal for recording voice or other musical instruments on your computer. It is as simple as connecting the XLR plug of the LightSnake cable to a microphone and then connecting the USB end to a computer USB port. This is a true USB plug and play connection. No additional drivers are needed for most operating systems. An embedded 16 Bit Analog to Digital Converter with audio signal boost ensures extremely low audio loss and 48/44.1 KHz Sampling Rate provides a high audio quality while recording. The HSDL (Host Side Data Loss) Noise Reduction function prevents any unwanted noise when converting the audio signal to digital format and saving to a computer. Connect your guitar / instrument directly to your computer. Start recording instantly. Analog to digital converter built into cable. Digital quality sound input. No need for a sound card. Embedded A/D chip technology with audio signal boost eliminates the need for additional signal conversion devices. Patented "Live when Lit" technology - cable ends light up indicating when sound is being transmitted. 10 Foot heavy-duty shielded cable. Includes " to Mini Adaptor and " Male to Dual " Female Splitter. Compatible with Win98 SE / Win ME / Win 2000 / Win XP and Mac OS9 / OS X without additional driver. Simple USB plug-and-play connectivity . Awesome product - makes your home studio! I have a Nady StarPower 1 dynamic mic and had not been able to use it for Rock Band on my 360; I tried another XLR-to-USB product and it did not work. I suspect the lack of phantom power is what makes this work with both Rock Band and Karaoke Revolution: American Idol Encore (although it doesn't work that well with the latter; I suspect that's by the programmers' design). This mic cable does exactly what it says, exactly like it should. The lights on each end blink when the system is monitoring the cable, which is nice to know, but might get annoying after a while. this thing is pretty awesome. it works about as it says it should (which is always nice, especially considering how many things you get out of the box and for reasons beyond explanation they Just Don't Work.). i am running it on vista, and it really was just plug and play, installed the drivers automatically. and i get much better sound out of it than running an xlr cable through an adaptor into the 1/8 inch jack i already had on my laptop. Great quality item, but has a buzz. I was really impressed with this product when I got it. The quality is so much better than I expected. This is not the type of cable that will easily break. It is plug and play for Mac, and has a CD for Windows-based machines. Unfortunately, when I use it with my Mac, I get some serious buzz in the background - so much so that I stopped recording with it. I am not sure what the problem is, but the buzz is loud enough to be annoying. Good quality cable if you want to give it a shot. The buzz could be how it talks to my computer and you may not have the same problem. It could also be my mic.